If you're a fan of Friday Night Lights, getting your heart broken is a routine experience. Whether it's because of the tear-jerking plotlines on the show (Street's injury, Matt's dad dying) or the antics of cast members off-screen (those Emmy losses, Battleship), FNL fans are, by now, well-versed in dealing with emotional trauma. Still, none of us were prepared for the agony that was 2013, during which time we got our hopes up, only to see them crushed, over the possibility of a Friday Night Lights movie time and time again. 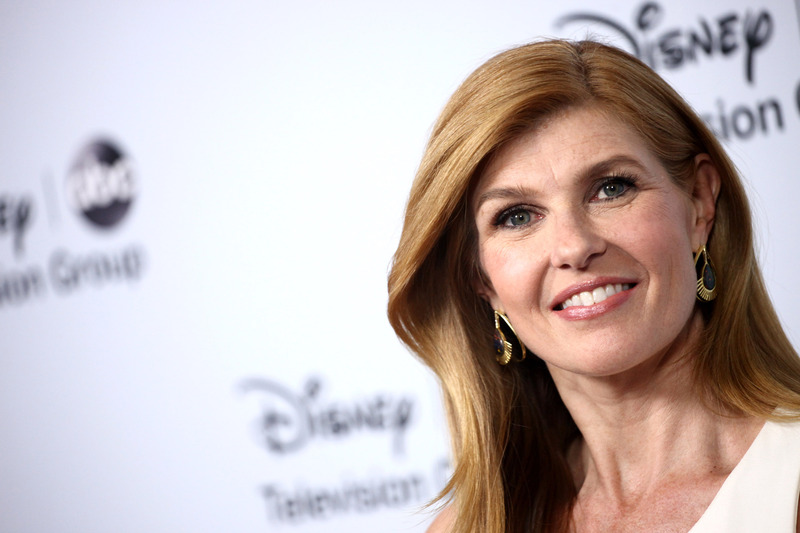 Apparently, though, fans aren't the only ones who've struggled through the "will they or won't they" filmmaking saga; Connie Britton, aka Tami Taylor, has revealed that she is "choosing the right moment to use" blackmail information on her co-stars, in order to make the FNL movie finally happen. Look, we don't blame her. Nashville isn't a horrible show, but it's certainly a step down from the greatness that was Friday Night Lights. As country legend Rayna James, Britton has had to deal with divorce, restraining orders, car wrecks, and comas, among other issues, all in the span of a season and a half. That's a lot more drama — and a lot less delicately handled — than anything Tami Taylor went through on Friday Night Lights. If Britton wants a break from Nashville, it's certainly understandable. Again, we don't blame her. Who doesn't love Kyle Chandler? While filming the series, Britton and Chandler often spoke of their close friendship, revealing adorable details like how they'd drive together from California to Texas each year when FNL production began and how they call each other pet names like "Sugar." Sure, Chandler's happily married and Britton's said many times that there's nothing between them, but you can't help but wonder — was the chemistry between Coach and Tami all acting? We wouldn't be surprised (and completely delighted) if Britton wants the FNL movie so badly because of her desire to be reunited with her fake TV husband. Perhaps we've been fooled. Maybe it's not Chandler Britton's dying to see again, but the actor behind one of her Dillon High students, Tim Riggins. On the show, it'd seem implausible for Tami and Riggins to ever have a thing, but in real life, the two actors are only fourteen years apart. It wouldn't be shocking if Britton, like the rest of the world, was harboring a big crush on #33. The last we saw of Julie Taylor, Britton's on-screen daughter, she was 19, engaged to Matt Saracen and presumably living with him in Chicago. Sure, the couple looked happy, and they'd finally gotten Eric and Tami's approval, but as all FNL fans know, when Julie Taylor's involved with something, chances are it's gonna be a disaster. Maybe Britton is worried about her fake daughter's fate, and wants to make sure that Julie and Matt truly did get their happily ever after, or at least haven't been completely ruined by Julie's habits of sleeping with teachers/getting into car crashes/letting her parents think she was raped by Tim Riggins. Because she does that. Perhaps the reason Britton wants an FNL movie so badly is simple: she loved the show. Like many of her former co-stars, Britton has expressed her admiration of the series, gamely sharing behind-the-scenes info and slamming anti-women politicians for using the "clear eyes, full hearts" FNL anthem to support their campaigns. Britton, like us, is a true fan of the show. She knows that no matter how good the rest of her career is, nothing will compare to the experience of playing the beloved, idolized, shiny-haired Tami Taylor. Like all FNL fans, Britton knows that while the series ended perfectly, any excuse to get the residents of Dillon, Texas on screen together again would be worth pursuing. And so she won't stop fighting for the Friday Night Lights movie to happen, no matter the odds, because, like us, she wants nothing more than to see one of the best dramas ever on TV come alive once again.